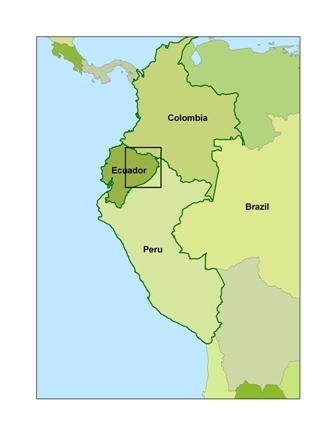 This data set provides 90-meter resolution Digital Elevation Model data used in the University of North Carolina's Carolina Population Center (CPC) Ecuador Projects. The topographic data were derived from Shuttle Radar Topography Mission (SRTM) C-band and X-band interferometric synthetic aperture radars (IFSARs) data that were acquired over 80% of Earth's land mass in February 2000. This data set includes one image in GeoTiff format that is a subset for the Northern Ecuadorian Amazon region. Figure 1. Northern Ecuadorian Amazon subset of the 90-meter Digital Elevation Model data. The investigators were Bilsborrow, Richard E.; Walsh, Stephen J.; Ruiz, Alicia; Baquero, Francis; Barbieri, Alisson Flavio; Boschini, Laura Patricia; Bremner, Jason Lee; Erlien, Christine; Frizzelle, Brian; Gray, Clark; Mena, Carlos; Messina, Joseph P. and Pan, William. You may contact Walsh, Stephen J. (swalsh@email.unc.edu). There is one GeoTiff at 90-meter resolution with this data set. This data set may be used in studies requiring topographic data, climate studies (when combined with orographic data), or determination of surface water area and elevation. The Northeastern Ecuadorian Amazon is significant from social, biophysical, and geographical bases, with complex terrain and landuse/landchange variability. The western Amazon region, bordering the Andes and lying at the headwaters of the Amazon River basin, possesses several major centers of endemism, including the Napo. Settlers in the Napo and Sucumbios provinces, the two dominant Cantons or States, settled on 50 ha plots, clearing primary forest to grow subsistence crops, coffee, and for pasturage. The annual precipitation is high (2,800 mm/year), so there is no distinct dry season. Despite the region's global biodiversity and carbon sequestration significance, agricultural settlement and consequent deforestation threaten the region (Messina and Walsh, 2001). All tiles were acquired from U.S. Geological Survey (USGS). The Shuttle Radar Topography Mission (SRTM) aboard the Space Shuttle Endeavor launched on Feb. 11, 2000, for an 11 day mission. SRTM used the same radar instrument that comprised the Spaceborne Imaging Radar-C/X-Band Synthetic Aperture Radar (SIR-C/X-SAR) that flew twice on the Space Shuttle Endeavor in 1994. SRTM was assigned to collect 3-D measurements of the Earth's surface. To collect the 3-D data, engineers added a 60-meter (approximately 200-foot) mast, installed additional C-band and X-band antennas, and improved tracking and navigation devices. Topographic data was acquired from C-band and X-band interferometric synthetic aperture radars (IFSARs) over 80% of Earth's land mass (between 60 deg N and 56 deg S). The goal was to produce digital topographic map products that meet Interferometric Terrain Height Data (ITHD)-2 specifications (30 m x 30 m spatial sampling with <=16 m absolute vertical height accuracy, <= 10 m relative vertical height accuracy and <=20 m absolute horizontal circular accuracy). All accuracies are quoted at the 90% level, consistent with National Map Accuracy Standards. Messina, J.P. and S.J. Walsh. 2001. 2.5D Morphogenesis: Modeling Landuse and Landcover Dynamics in the Ecuadorian Amazon. Plant Ecology, 156 (1): 75-88. Rodriguez, E., C.S. Morris, J.E. Belz, E.C. Chapin, J.M. Martin, W. Daffer, S. Hensley, 2005, An assessment of the SRTM topographic products, Technical Report JPL D-31639, Jet Propulsion Laboratory, Pasadena, California, 143 pp.